The picks should not be embarrassingly bad. I shall spend no more than one work day on this activity (and 30 minutes for this post). This year I spent two hours cleaning up and running my code from last year. My own eigenvalue centrality model, which tends to do a good job all by itself. Dean Oliver’s “Four Factors”, which I calculate from per-game data. I transformed team ranks to continuous variables given a heuristic created by Jeff Sonos. One hot encoding of categorical features. Upset generation. I found the results to be not interesting enough, so I added a post-processing function that looks for games where the win probability for the underdog (a significantly lower seed) is quite close to 0.5. In those cases the model picks the underdog instead. The model predicts the probability one team defeats another, for all pairs of teams in the tournament. The model is implemented in Python and uses logistic regression. The model usually performs well. Let’s see how it does this year! Every year since 2010 I have used analytics to predict the results of the NCAA Men’s Basketball Tournament. I missed the boat on posting the model prior to the start of this year’s tournament. However, I did build and run a model, and I did submit picks based on the results. Here are my model’s picks – as I write this (before the Final Four) these picks are better than 88% of those submitted to ESPN. I shall spend no more than one work day on this activity (and 30 minutes for this post). Massey ratings which I obtained here. Upset generation. I found the results aesthetically displeasing for bracket purposes, so I added a post-processing function that looks for games between Davids and Goliaths (i.e. I compare seeds) where David and Goliath are relatively close in strength. For those games, I go with David. I submitted the model to the Kaggle NCAA competition, which asks for win probabilities for all possible tourney games, where submissions are scored by evaluating the log-loss of actual results and predictions. This naturally suggests logistic regression, which I used. I also built a fancy pants neural network model using Keras (which means to run my code you’ll need to get TensorFlow and Keras in addition to the usual Anaconda packages). Keras produces slightly better results in the log-loss sense. Both models predict something like 78% of past NCAA tournament games correctly. I did not actually train the model on past tournaments, only on regular season games. That’s just because I didn’t take the time. NCAA games are not purely “neutral site” games because sometimes game sites are closer to one team than another. I have code for this that I will probably use next year. I am splitting the difference between trying to create a good Kaggle submission and trying to create a “good” bracket. There are subtle differences between the two but I will spare you the details. I will create a github repo for this code…sometime. For now, you can look at the code and raw data files here. The code is in ncaa.py. I shall spend no more than on this activity (and 30 minutes for this post). I will share my code and raw data. A “win probability” model developed by Joel Sokol in 2010 as described on Net Prophet. An eigenvalue centrality model based on this post on BioPhysEngr Blog. Home-court advantage is considered: 2.5 points which was a rough estimate I made a few years ago and presumably is still reasonable. The win probability is scaled by an adjustment factor which has been selected for best results (see below). Recency is considered: more recent victories are weighted more strongly. How do I know these picks aren’t crap? I don’t. The future is uncertain. But, I did a little bit of backtesting. I trained the model using different “win probability” and “recency” parameters on the 2013-2015 seasons, selecting the combination of parameters that correctly predicted the highest percentage of NCAA tournament games during those seasons, getting approximately 68% of those games right. I don’t know if that’s good, but it seems to be better than applying either the eigenvalue centrality model or the win probability model separately. In general, picks produced by my models rank in the upper quartile in pools that I enter. I hope that’s the case this year too. 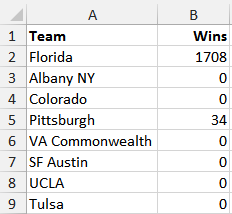 I have created a simulation model in Microsoft Excel using Frontline Systems’ Analytic Solver Platform to predict the 2014 NCAA Tournament using the technique I described in my previous post. Click here to download the spreadsheet. 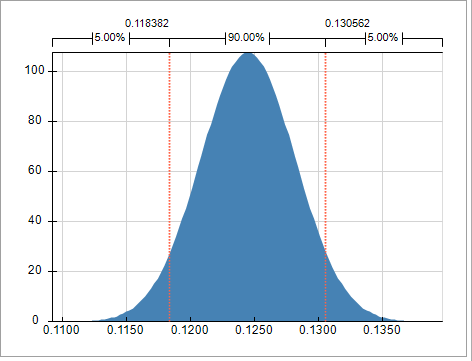 The peak of the bell curve (normal) distribution is at 0.1245, the rating calculated in my previous post. Analytic Solver Platform samples different values from this distribution (and the other 63 teams), producing slightly different ratings, over and over again. As the ratings jiggle around for different trials, different teams win games and there are different champions for these simulated tournaments. In fact, if you hit F9 (or the “Calculate Now” button in the ribbon), you can see that all of the ratings change and the NCAA champion in cell Y14 sometimes changes from Virginia to Florida to Duke and so on. We see that even though Virginia is predicted to be the most likely winner, Florida and Duke are also frequent winners. What’s nice about the spreadsheet is that you can change it to do your own simulations. Change the values in columns D and E in the Bracket worksheet to incorporate your own rating system and see who your model predicts will win. The simulation only scratches the surface of what Analytic Solver Platform can do. Go crazy with correlated distributions (perhaps by conference?) or even simulation-optimization models to tune your model. Have fun. Click here to download the Python model source code. Recently played games should count more than games at the beginning of the season. Edge weights should reflect the probability one team is stronger than another, rather than probability one will beat another on a neutral floor. The first issue is easy to explain. In my initial model, game-by-game results were analyzed to produce edge weights in a giant network linking teams. The weight was simply the formula given by Joel Sokol in his 2010 paper. However, it seems reasonable that more recently played games are more important, from a predictive perspective, than early season games. To account for this factor, I scale the final margin of victory for more recently played games by a “recency” factor R. If one team beats another by K points at the start of the season, we apply the Sokol formula with K. However, if one team beats another by K points at the end of the season, we apply the formula with R*K. If R=2, that means a 10 point victory at the start of the season is worth the same as a 5 point victory at the end. If the game was in the middle of the season, we’d apply half of the adjustment: 7.5 points. The second issue – regarding edge weights and team strength – is more subtle. As you saw in the “Top 25” from my preview post, there were some strange results. For example, Canisius was rated #24. The reason is that the Sokol formula is not very sensitive to small margins of victory. If you try the values 1..6 you get the probabilities [0.477, 0.485, 0.492, 0.5, 0.508, 0.515]. This means that the difference between a 1-point home win and a 6-point home win is only 0.515 – 0.477 = 0.0377 ~= 3%. This means that most of the nonzero values in the big adjacency matrix that we create are around 0.5, and consequently our centrality method is determining teams that are influential in the network, rather than teams that are dominant. One way to find teams that are dominant is to scale the margin of victory so that a 6-point victory is worth much more than a 1-point victory. So the hack here is to substitute S*x for x in the formula, where S is a “sensitivity” scaling factor. One last tiny adjustment I made was to pretend that Joel Embiid did not play this year, so that Kansas’s rating reflects their strength without him. Long story short, I subtracted 1.68 points for all games that Joel Embiid appeared in. This post has the details. Virginia, Florida, and Duke are all pretty close. Virginia had a consistently strong schedule. Their losses were generally speaking close games to strong opponents. They had several convincing, recent victories over other very strong teams. 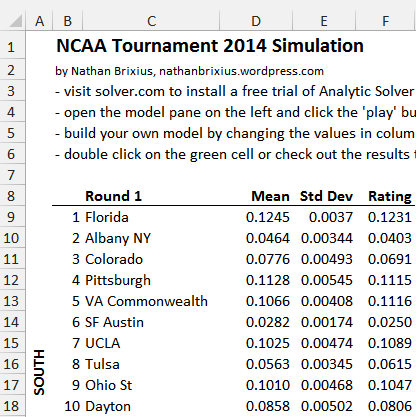 In a future post, I will provide an Excel spreadsheet that will allow you to build and simulate your own NCAA tournament models! 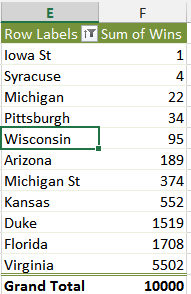 Here are my picks for the 2014 NCAA Tournament, based on the analytics model I described in this post. This post contains the picks and my next post will contain the code and methodology for the geeks among us. I use analytics for my NCAA picks for my own education and enjoyment, and to absolve responsibility for them. No guarantees! Here is a link to picks for all rounds in PDF format. Here is a spreadsheet with all picks and ratings. This year’s model examined every college basketball game played in Division I, II, III, and Canada based on data from Prof. Peter Wolfe and from MasseyRatings.com. The ratings implicitly account for strength of opposition, and explicitly account for neutral site games, recency, and Joel Imbiid’s back (it turned out not to matter). I officially deem these picks “not crappy”. The last four rounds are given at the end – the values next to each team are the scores generated by the model. The model predicts a few upsets (though not too many). The winners of the “play-in games” are projected to knock off higher seeded Saint Louis and UMass. Kentucky is also projected to beat Louisville, both of whom probably should have been seeded higher. Baylor is projected to knock off Creighton, busting Warren Buffett’s billion dollar bracket in Round 2. Joel Embiid is the starting center of the Kansas Jayhawks and one of the most talented college basketball players in the country. Unfortunately he suffered a stress fracture in his back and is likely to miss at least the first weekend of the upcoming NCAA tournament. Some think that Kansas is headed for an early round exit while others think that Kansas’s seed should not be affected at all. 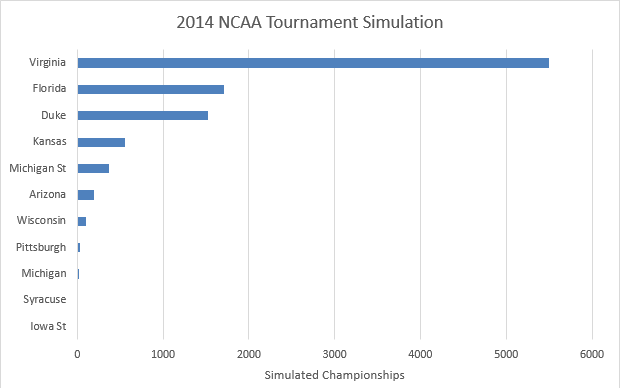 Can we use analytics, even roughly, to assess the impact on Kansas’ NCAA tournament prospects? How about looking at win shares? A “win share” is a statistical estimate of the number of team wins that can be attributed to an individual’s performance. According to the amazing Iowa-powered basketball-reference.com, Embiid’s win shares per 40 minutes are an impressive 0.212 (an average player is around .100). HIs primary replacement, Tarik Black, is at 0.169. That’s a difference of 0.042 win shares per 40 minutes. I probably can’t technically do what I am about to do, but who cares. Since Kansas averages 80 points a game, the win share difference is 80 x 0.042 = 3.36 points per game. However, Embiid was only playing around 23 minutes a game, and Black isn’t even getting all of his minutes. Certain other teammates (Wiggins!) may simply play more minutes than usual to compensate. So 3.36 is probably on the high side. If we estimate that Embiid’s presence will be missed for only 20 player-minutes per game, an estimate of 1.68 points per game is probably reasonable. I will use this assumption in my upcoming NCAA Tournament model. If we look at Kansas’s schedule we see that this difference would possibly only have swayed two games (Oklahoma State and Texas Tech). Embiid’s loss should not affect his team’s seeding any more than it already has by having lost to Iowa State in the Big 12 tournament. Kansas is a solid 2 seed, but Embiid’s loss, if prolonged, could delay a fifteenth Final Four appearance.